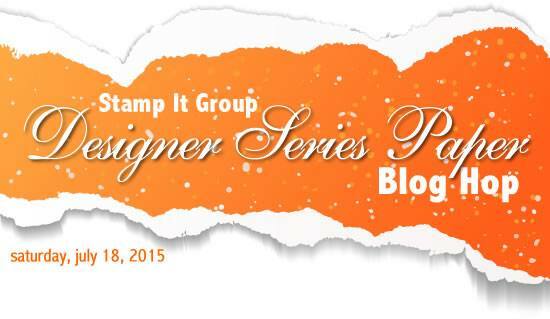 Welcome to my contribution to the Team Stamp It Group Designer Series Paper (DSP) Blog Hop. You may have come here by way of Linda Cullen’s blog. She is so talented … didn’t you love what she did with the School House DSP? Or, you may have started here, at my blog. However you got here, be sure to visit everyone in the hop! I used English Garden DSP for my trio of cards. I LOVE this paper. Because my cards are 5″ x 5″, I also made matching envelopes. Cute ..right? 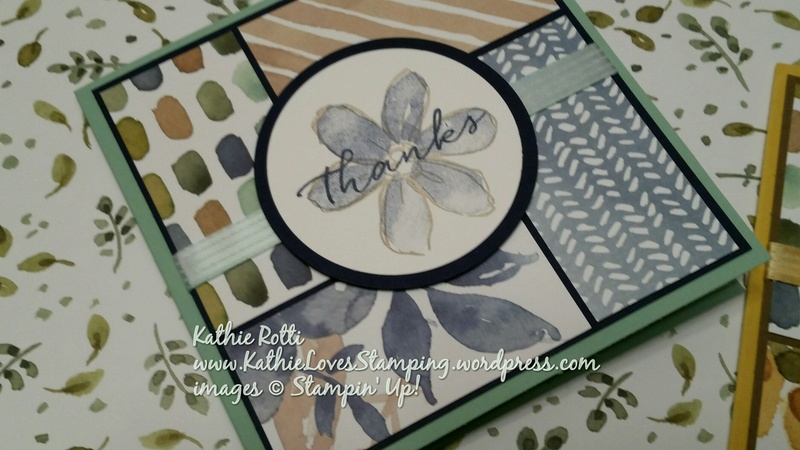 For stamp sets, I used Garden in Bloom (I love the two- and three-step stamping technique) and the sentiments from the Watercolor Wishes Kit. These cards are super quick to put together. The DSP is cut to 1.5″ x 3″. You need 4 pieces. The pieces are merely adhered to a piece of 4.75″ x 4.75″ piece of cardstock. 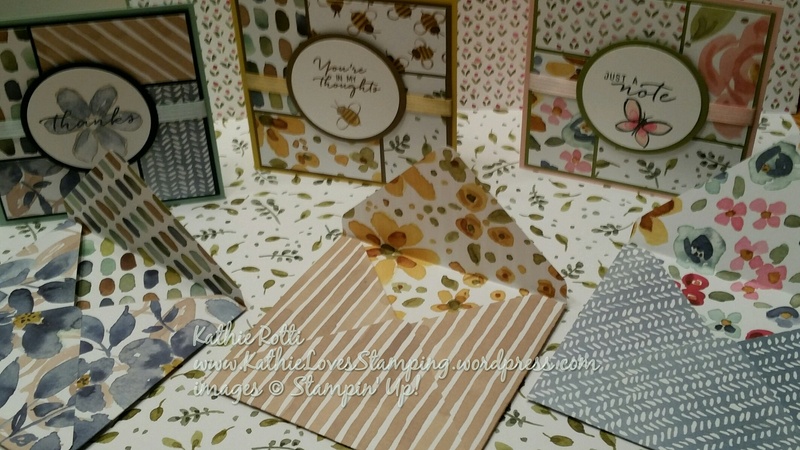 The color coordinating card base is 10″ x 5″, scored at 5″ . I used Old Olive and Blushing Bride for the above card. The card on the right is a Mint Macaron base and Night of Navy layer. I used the Circles Collection Framelits to cut the solid color layer under the sentiment. 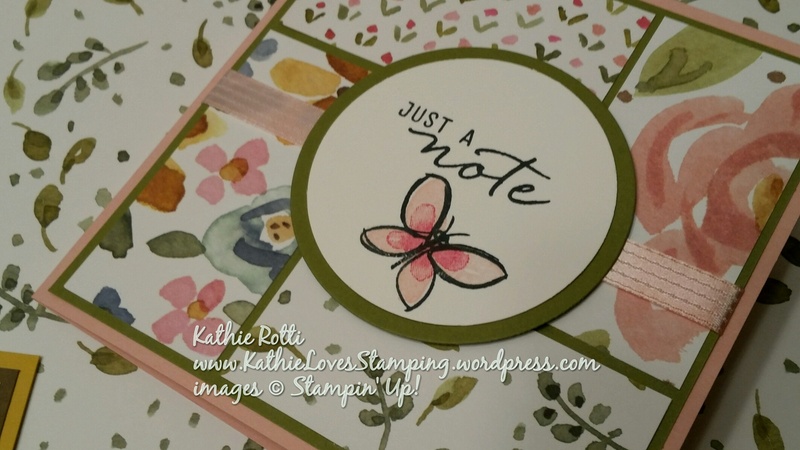 The 2 1/2″ Circle Punch was used to punch out the sentiment that was stamped on Whisper White. The last card is my favorite. I just love the bees!! Hello Honey and Soft Suede are the colors used. The ribbon on each of the cards has been dyed with alcohol and re-inkers. I used the Whisper White 3/8″ Stitched Satin Ribbon. I used the color of the card base to dye the ribbon. I did pop up the circle on dimensionals. I hope you enjoyed my cards. I got the layout for them from Stamping School. Now off you go to visit Mary Bush to see how she used some papers from the Go Wild DSP Paper Stack. < Previous Would you like TWO free stamp sets? wow! Kathie!!! these are all awesome! Beautiful cards! I love these Kathie! Beautifully made!